Home / Installations / Land yourself in some hot water! Traditional electric geysers have always been the go-to choice for most South Africans when building their homes. Back in the day, electricity was cheap and water was plentiful, but these days both utilities are quite expensive and in short supply! Gas geysers, or more accurately, gas water heaters, are an obvious solution that would help reduce consumption of both water and electricity, but how do they work and what is involved in converting to gas? Gas geysers can be split into 3 major groups, namely Gas powered geysers with a large storage tank for hot water, Simple Instant gas water heaters and Fan Forced instant gas water heaters. Gas geysers with storage tanks, are very rarely used in South Africa, and the argument could be made that they are quite inefficient, since they can potentially use quite a lot of gas, simply keeping the hot water in storage at temperature. These units are far more popular in European countries where natural gas is abundant and supplied via pipelines to users’ homes. When a hot water tap is opened, water flows into the unit via its cold water inlet. The pressure of the water entering the unit pushes against a rubber diaphragm inside a brass casing. The diaphragm in turn then pushes onto a disk with a long pin attached to the back of it. The movement of this pin has 2 functions, firstly it opens the gas flow to the pilot flame (where fitted, not all units use a pilot flame) and secondly it operates an electronic switch which tells the unit that water is flowing, gas is coming through and it’s time to ignite. The small electronic controller then starts firing the electronic ignitors or sparkers which ignites the pilot flame. Although some units no longer use a pilot flame and will ignite the main burner straight away. Once the pilot is lit, the controller will open the main gas solenoid valve and allow gas to flow up through the main burners, which would then be ignited by the pilot flame (or ignitors if no pilot flame is used). All of this takes about 1 to 3 seconds. With the main burners lit, the water flowing through the unit passes through a highly efficient heat exchange unit above the burners, which allows the water to heat up to temperature, for most units this will give you a temperature increase of up to 45 degrees above your input temperature, more than enough for a nice hot shower. When the tap is closed, pressure on the diaphragm disappears and the entire unit shuts down, the main burners are shut off, the pilot flame is extinguished, the electronics shut down – the whole unit simply goes to sleep, ready for the next time someone opens a tap. All of the units we carry are fitted with a host of safety devices including flame failure devices, which shut of the gas supply should a sudden gust of wind extinguish the flame; temperature sensors to prevent overheating or damage if water is frozen inside the unit; and sensors which shut the system down should it detect any other faults on the unit. Although the benefits of these systems are many, there are a few minor drawbacks. Because the units are ‘switched on’ by water pressure, they require a minimum water pressure of around 1 Bar in order to work properly. We have had systems running on far lower pressures than that, but it is important to understand that this can cause problems if not set up properly. Another oddity with these systems is that our usual motto of going for overkill, would not work for these geysers. Gas water heaters are rated in liters per minute, and we have a natural tendency to believe that bigger is better, but as I said, with these systems that won’t work. If for example you connected a 16L/min water heater to a single small basin, even opening the hot water tap fully, may not generate enough water flow for the unit to switch on and stay on. At best it might turn on and as the water pressure stabilizes, the drop in pressure will cause it to switch off again. Always make sure you choose a suitably sized unit for your application. The final thing to consider with these units is that they are not recommended for use with mixer taps. The cold water side of the mixer taps, tend to create back-pressure on the hot water side, when both hot and cold taps are open. Since the units run on water pressure, this causes them to shut down if the back pressure becomes too great. The way to work around this is to set the water heater’s output temperature so that it is exactly the temperature required for your shower or whatever application you may have. So when you have a shower, you ONLY open the hot water tap. In a way this adds to the efficiency of the unit, since you are not using fuel and energy to heat up water, which you are just going to cool down again by adding cold water to the mix. The simplicity and low cost of these units make them the perfect choice for holiday homes, AirBnB Cottages, granny flats or even campers, provided there is sufficient water pressure. The fan forced systems are a little different and generally have much higher output ratings than the normal diaphragm operated systems (20L/min+). Firstly, these units generally work on water flow rather than pressure, which means that they are far more tolerant of mixer taps and lower water pressures and flow rates. Designed to be a complete replacement for a family home’s electric geyser, these larger units are designed to cope with small water flows, such as a single basin, but still be powerful enough to supply hot water to 2 or even more showers at once. The system uses a water flow sensor to detect when a tap has been opened, and based on the amount of water flow, it’s computer controller decides exactly how much gas to use. Some units even have staged burners, so only a section of the main burner would be lit if only a small amount of water is being drawn. The computer controller also has a preset temperature to which it will heat the water, so your water comes out at the same temperature every day regardless of ambient conditions. To increase the efficiency of the systems, they are fitted with an air fan, which blows air into the burners to supply them with even more oxygen and driving the hot air through the heat exchange unit for better heat transfer to the water. The fan works very much like a turbo-charger on a car, allowing a more efficient burn by feeding the ‘engine’ with more usable air. The drawbacks of these systems are very few, and they work extremely well, but they are slightly more expensive to buy than the natural draft gas water heaters. Their installation can also be slightly more complicated in that they do require an electrical connection for the computer controller and the fan unit. However, it is important to note, this is not a high current electrical connection and a normal plug socket is more than adequate. The unit only draws electrical power while it is operating, that is to say, it only draws electrical power while a hot water tap is open – and even then it only draws the same current as a 40W light bulb. Another major benefit of some Fan Forced systems is that some of these units, like the Paloma range of gas water heaters, are fitted with water temperature sensors on their inputs. What this means is that you could install one in series with a solar geyser to reduce your gas and electricity consumption for the ultimate ‘green’, energy efficient solution. By installing the Paloma water heater, after your solar geyser, water flowing from the solar geyser will enter your gas water heater first. If the temperature sensor detects that the input water is already hot enough, the gas water heater will simply allow the water to flow through it and straight to the tap. If however, early in the morning for example, the water from the solar geyser is not quite hot enough, the gas water heater will detect this and ignite itself, to ensure you still get your hot water inside the house. We always recommend that you contact an SAQCC Registered Gas installer first, before planning your installation. The gas installer will be able to choose the best location for installing your gas water heater, which is important, because your plumber would then have to lay the water pipes to that location for connection to the water heater. All that is required is a cold water supply to the unit, and a hot water line back into your water system. For fan-forced systems, an electrical connection may also need to be installed. Take the time to read our articles on the website with regards to Planning a Legal gas installation as this will help you avoid disappointments later on. How does this translate into savings? Lets deal with the energy savings first – Obviously a hot water storage geyser wastes tonnes of energy, since it constantly has to switch on high wattage electric elements to keep the water in the storage tank at temperature. Gas water heaters ONLY use energy while the tap is open, so over the span of a month, it already uses far less energy than any hot water storage system. Further savings come from the efficiency of the systems. LPG has an extremely high calorific value, or translated into English, even a small amount of gas, has a very large amount of energy stored in it, which means not very much gas gets used to heat the water. For example, even the larger gas water heaters running at absolute maximum capacity (which would almost never be the case) will use around 1.2 to 1.5 KG of LPG per hour of running time. Given that you are very rarely going to be running your hot water taps for hours at a time, this translates to very frugal gas consumption. Pop into our Retreat Mega-store and chat to our sales staff about your requirements; we can send our technician out to you for a free quote on installing your gas water heaters. If you have questions about gas water heaters, or if you have a gas water heater, leave your comments below, and remember to click subscribe to stay updated with the latest news from Eddlesgas. 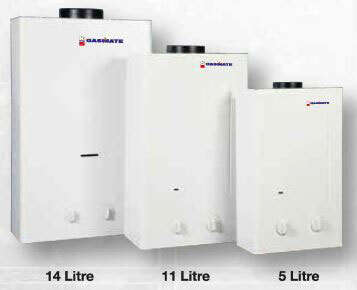 Have a look at some of the gas water heaters we stock, or contact us with your requirements. * Price comparisons based on a 20Lt/min Kwikot gas water heater AND 6Lt/min Safegas water heater – vs- a Kwikot 250L electric geyser OR Kwikot Solar geyser. ** The development in Paarl comprised over a hundred 20L/min Kwikot water heaters. The development in Kenilworth will be using a solar geyser connected in series with Paloma gas water heaters.